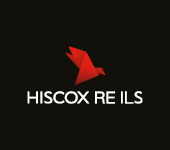 An average 36% of seven sample reinsurance placements of $500m or greater was placed with non-traditional reinsurance markets or using catastrophe bonds, according to data from reinsurance broker Willis Re. This interesting fact comes to light from a chart presented by James Kent, President of reinsurance broker Willis Re North America, at the recent 2014 Meeting of Reinsurance Officials held in Miami. 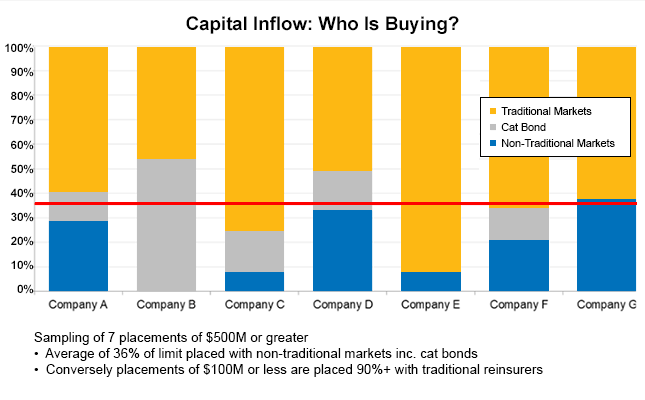 The chart shows the mix of reinsurance capital used by a sample of $500m+ reinsurance placements. The data shows that larger reinsurance purchases tend to use more non-traditional (or alternative) reinsurance capital and instruments such as catastrophe bonds. Conversely, smaller reinsurance buys tend to use less non-traditional capacity, according to the data, with placements of $100m or less tending to be 90% traditional reinsurance capacity. So what does this show? Bigger reinsurance buyers are more familiar with alternative capital and instruments such as insurance-linked securities (ILS) or catastrophe bonds, hence a larger share of their reinsurance programmes goes to the alternative reinsurance market. It also shows that for smaller insurers, or buyers of smaller reinsurance programmes, the relationship aspect of the traditional reinsurance market remains the biggest draw at this time. It would , however, be very interesting to see how these numbers have changed over time. We suspect that smaller placements will have grown their non-traditional capacity participation in the last year perhaps just as much as larger placements. It may also show that ILS and collateralized capacity feels more at home and better able to find its return sweet spot within larger reinsurance programmes. The competition to serve the smaller reinsurance purchases may also be a lot higher, making the likelihood that alternative capital is deployed in the larger reinsurance placements greater. It’s also interesting to see the different mixes of non-traditional capacity, in the form of collateralized reinsurance, alongside use of catastrophe bonds. The chart, although just a sample of seven programmes, shows that the reinsurance buyers clearly have different motivations and levels of affinity with different types of protection. There will also be an element of the perils to be covered driving the capacity types, so some buyers find cat bonds more efficient than others depending on the investor appetite in that market, as well as how effective risk models are for their coverage needs, at renewal time. What this also shows and is important to note for ILS and collateralized players is the opportunity to grow their share of smaller reinsurance programmes is clear. With less than a 10% share of the smaller than $100m reinsurance placements there is an opportunity to increase that. It stands to reason that insurers and cedants will look to further diversify their reinsurance capital sources over time, as they become more familiar and comfortable with alternative capacity sources. That represents a growth opportunity for the ILS and collateralized markets which may enable more capital to be put to work in future. We covered James Kent’s presentation in more depth here yesterday: Alternative reinsurance capital, a seismic change: James Kent, Willis Re.